Home » Outlook » Is Outlook Email Recovery Possible from a 0KB PST File? Have you ever come across a situation where the size of an Outlook data file becomes 0KB? This is one of the most common issues faced by Outlook users. I’ve often seen users asking whether it’s possible to recover anything from a 0KB PST file. There are many articles containing the information regarding this topic. However, only a few of them provide the right information. 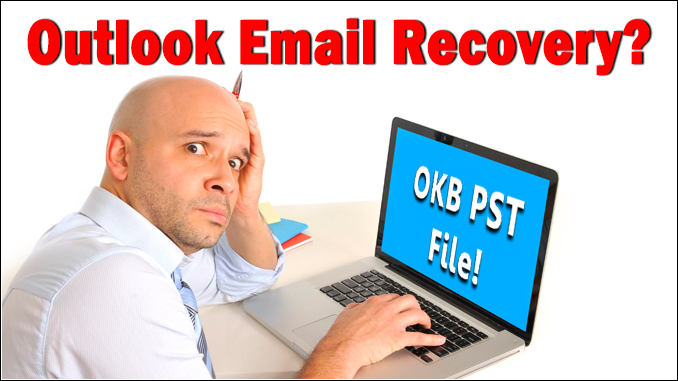 In this article, we’re going to discuss whether Outlook email recovery is possible from a 0KB PST file. I had no idea why this is happening. Then I checked the size of that PST file, and I found it was 0KB. I was lucky because I had the backup. I restored almost all the mailbox data from the PST backup I took earlier. This is something what I personally experienced. Many of you would’ve faced a situation like this. How many of you have successfully recovered your data from a 0KB PST file? Perhaps none of you would’ve done that. Because if you ask me whether it’s possible or not, then my answer is NO. There’s no way to restore anything from a 0KB PST file, even if you use a professional PST Recovery tool. Outlook email recovery is only possible if you have a valid backup file. Let’s find out the most possible reasons for this common Outlook problem. One of the most common reasons for this common Outlook problem is running the check disk tool (chkdsk) more than often. Generally, the Check disk tool is primarily used to check the integrity of the disks. It thoroughly scans the disks and fixes the logical file system errors (if found). But if you run the chkdsk command more than often, the PST file may (possibly) become a 0KB PST file. Storing the Outlook data file on a network drive may put it at a high risk. Because whenever any sort of crash or error occurs in the network drive, it may damage the PST file. Even storing the PST file in a folder that syncs to the cloud may cause corruption and other issues. Generally, corruption is the most common reason for almost all common Microsoft Outlook problems. There are various reasons for Outlook mailbox corruption. And whenever corruption occurs in the Outlook mailbox, it may happen that the Outlook data file becomes a 0KB file. You copy a PST file which is already being used by Microsoft Outlook on your computer. Though this will create the PST file, the size would be 0KB. But the original PST file remains intact. Sometimes it may happen that you delete the original PST file without noticing its size. And then you realize that the PST file you deleted was the original one. Now you only have the 0KB PST file. Let’s suppose you write a PST file on a compact disk (CD). After that, you move it back to hard disk drive. And now when you try to open the PST file, you receive an error saying the Outlook file is not a personal folder file. You check the PST file size, it’s 0KB. Microsoft Outlook has a built-in feature, Auto-archive. If you enable this feature, Outlook will move the old emails and other items to a separate PST file on your computer system. So if you’ve enabled this feature earlier, you can use the archive PST file to perform Outlook email recovery. You just need to locate that archive file. First, launch Microsoft Outlook. On the taskbar, click the File tab > Info > Options. On the Outlook Options dialog box, click the Advanced tab (shown on the left side). You’ll see the AutoArchive option there. Under this option, click the AutoArchive Settings… button. On the AutoArchive dialog box, click the Browse… button. This will browse the location of the archive PST file. Now you can use this PST file, and don’t forget to check the file size. First, browse to the location where the Outlook folder containing the PST files is stored. Right-click the folder, and click “Restore previous versions”. On the Outlook File Properties dialog box, click the Previous Versions tab. Now you need to select the folder versions, and click the Copy… button. On the Copy Items dialog box, define a location where you want to copy the previous version of your Outlook data file (PST). Then click the Copy button. This will create the copy of your PST file. Important note: If you think that a 3rd party PST Recovery tool can really help you in Outlook email recovery from a 0KB PST file, you’re absolutely wrong. No 3rd party tool is capable to recover anything from a 0KB PST file. When a PST file turns into a 0KB file, this means nothing is left in the file. In such a situation, a 3rd party tool fails to recover anything from it. In this article, we’ve discussed a situation where the size of an Outlook data file becomes 0KB. Also, we’ve discussed the most common reasons for this problem. The article explained a couple of easy DIY tricks which you can use to restore the PST file if its size becomes 0KB. However, backup is the only reliable solution you can actually rely on. Therefore, it’s strongly recommended to take a backup regularly in order to prevent data loss.